Hillary Chybinski: not a good time for a distraction. . .
not a good time for a distraction. . .
. . .but for three days, i have been unable to put this book down. . .
i first saw it on donna's blog. . .and i needed some things for my tbr stack (to be read), so i picked it up at b & n. . .
it is FAN-freakin-TASTIC. . .i even bet it's great if you don't scrapbook. . .if you have any women friends and/or a family - i think you will like this book. 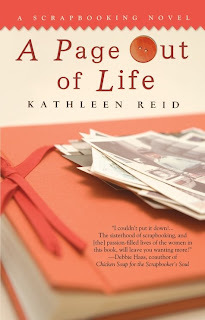 Kathleen Reid is a very talented writer and her characters really came alive for me. . .
this would make a great last-minute holiday gift for any readers on your list. . .